In this day and age, people deal with stress through different ways. Here’s a tip or two to help you beat stress everyday. SELF-AWARENESS develop a habit of paying attention to your expressions of thought, emotions, and behavior, knowing yourself, getting in touch with your feeling, or being open to experience, the more you know yourself, the better you are at adapting life changes that suit your needs. SCHEDULING: TIME MANAGEMENT optimize the time available to achieve gratifying results. Use time manager application or buy some notebook organizer. 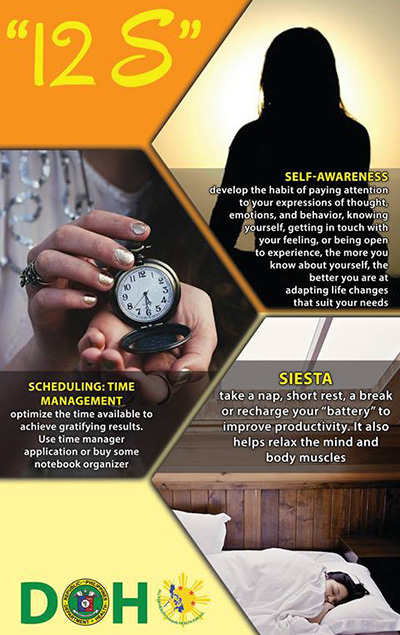 SIESTA take a nap, short rest, a break or recharge your “battery” to improve productivity. It also helps relax the mind and body muscles. 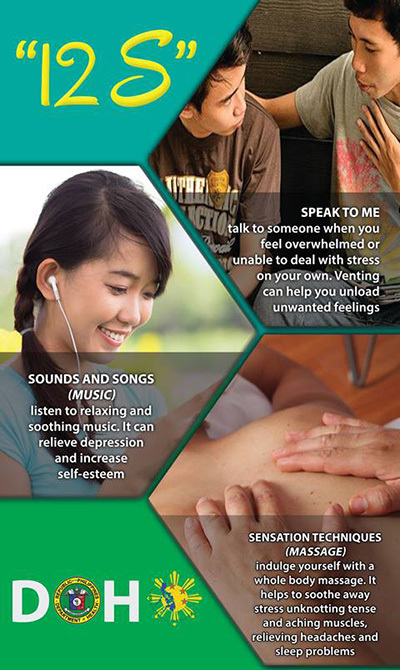 SPEAK TO ME talk to someone when you feel overwhelmed or unable to deal with stress on your own. Venting can help you unload unwanted feelings. SOUNDS AND SONGS (MUSIC) listen to relaxing and soothing music. It can relieve depression and increase self-esteem. SENSATION TECHNIQUES (MASSAGE) indulge yourself with a whole body massage. It helps to soothe away stress unknotting tense and aching muscles, relieving headaches and sleep problems. STRETCHING do simple movements to loosen muscles, lubricate joints increase body’s oxygen supply. 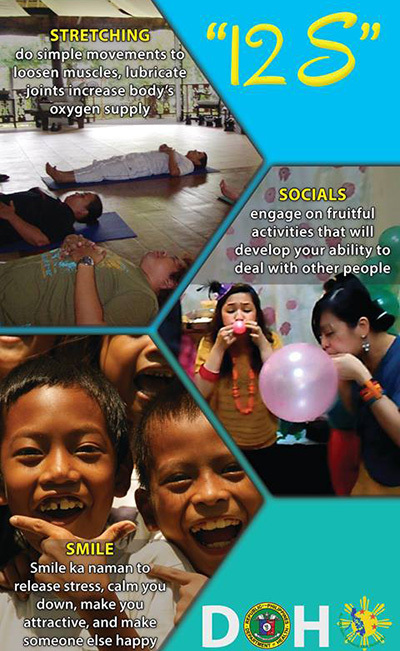 SOCIALS engage on fruitful activities that will develop your ability to deal with other people. SMILE smile ka naman to release stress, calm you down, make you attractive, and make someone else happy. 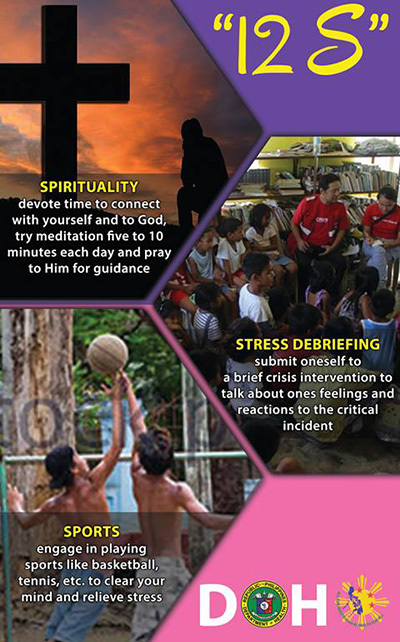 SPIRITUALITY devote time to connect with yourself and to God, try medication five to 10 minutes each day and pray to Him for guidance. STRESS DEBRIEFING submit oneself to a brief crisis intervention to talk about ones feelings and reactions to the critical incident. SPORTS engage in playing sports like basketball, tennis, etc. to clear your mind and relieve stress. This entry was posted in Health Advisory, Rest and Relaxation and tagged how to beat stress through 12 steps, stress buster tips on October 26, 2017 by Yami.